If you live in the United States and wanted to pick up Turtles in Time: Re-Shelled, your time is running out. 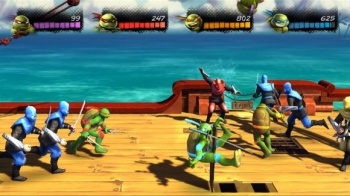 Thanks to an expiring license, Ubisoft told Joystiq that its remake of the classic SNES/arcade Ninja Turtles beat-em-up Turtles in Time would no longer be available for purchase in the United States after June 30th. Presumably, the game will still be available for purchase on XBLA and PSN after June 30th in places around the world that aren't the United States, so you Europeans and Aussies (et al) should still be good. That said, the game itself actually kind of sucked, so perhaps it's for the best after all.